Rodríguez denounces the injustices suffered by the populations of the Andean and Amazonian regions, dominated by a process of gradual urbanization, and, more generally, the exploitation of one part of Peruvian society by another, which exercises power over the former. The approach is experimental, the materials (salvaged from public spaces) are banal, and the collage technique allows them to be gathered together and reordered in a different way. Born in 1959 in Lima, Peru. Lives in Lima, Peru. Herbert Rodríguez studied fine art at the Pontificia Universidad Católica in Lima from 1979 to 1981. He joined the E.P.S. Huayco workshop, active from 1979 to 1981 during the transition to a new democratic regime in the country, as well as the Artistas Visuales Asociados collective in 1982, and at the end of 1984, the Las Bestias group, participating in the underground culture movement. 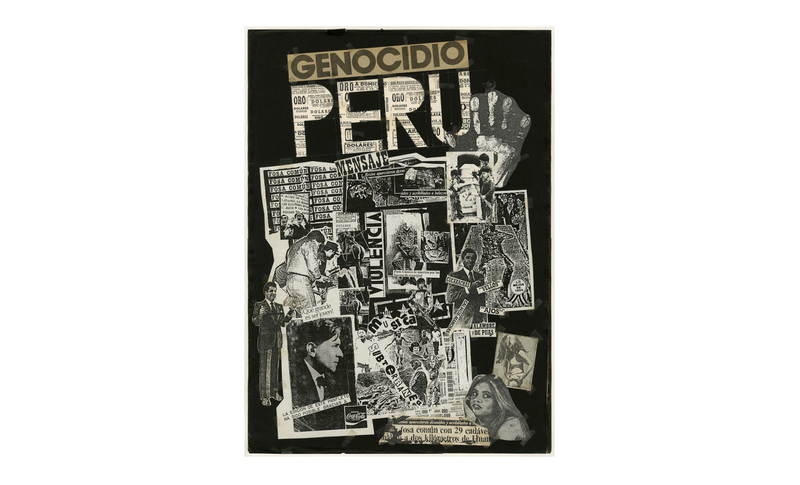 Using experimental techniques, these collectives drew inspiration from punk and Dadaist aesthetics, creating photomontages, collages, silkscreens, and assemblages. His work has been included in numerous solo and group exhibitions in Peru and the United States and as part of the exhibition entitled América Latina at the Fondation Cartier pour l’art contemporain in Paris in 2013.